Mopar Spring Loaded Hood Bumper Adjustment Wedges from Josh’s Muscle Car Parts are a must for the restorer that wants to keep his E-Body or B-Body hood in alignment. Our spring loaded hood wedges are built exactly like original Chrysler pieces. They are a two piece wedge held together by a steel spring. 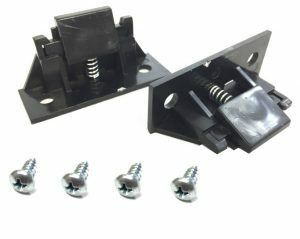 Each set of wedges comes with optional hood to fender mounting screws. 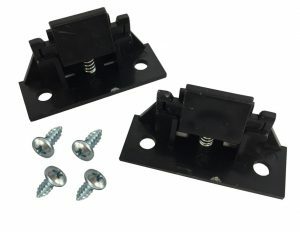 Our reproduction Mopar Spring Loaded Hood Bumper Adjustment Wedges are correct for 1970-1974 Plymouth Barracuda, Cuda and Dodge Challenger. They are also correct for 1971-1974 Dodge and Plymouth B-Body cars, including; RoadRunner, GTX, Charger, Coronet, SuperBee and more. Josh’s Muscle Car Parts prides ourselves at bringing the best-priced reproduction Mopar items to market. These wedges are the best price in the country, sold as a set and are 100% correct. You will not find a better quality set of adjustment wedges in the country…you can spend more though! We have thousands of set of these adjustment wedges in stock at all times, we sell more than anyone else in the nation and can typically have them to your door step within 2-3 days. 1970 Cuda Hockey Stick Stripe Kits from Josh’s Muscle Car Parts are built in the USA and licensed by Mopar. Our Genuine Mopar Restoration products are available in a variety of different graphics, numbers and letters. 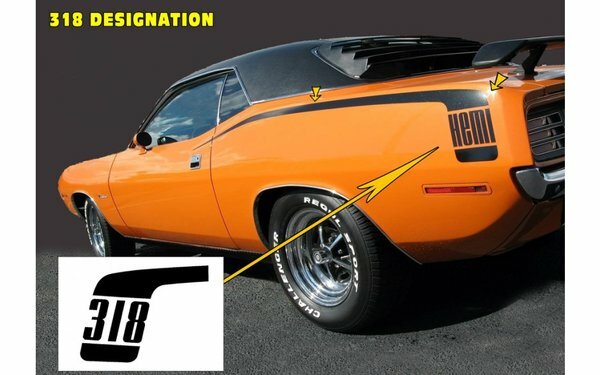 We offer these 1970 Cuda Hockey Stick Stripe Kits in the following call outs: 318, 340, 360, 383, 440 and HEMI. So no matter your engine size we’ve got you covered. On top of offering hockey stripes in the above numbers, we also offer them in all of the most popular colors. These colors include Flat Black (also known as Matte Black), Glossy Black, Red and White. Our hockey stripes for your Plymouth Barracuda include enough to complete one entire car. The rear quarter panels, both left and right, the small door pieces, both left and right and also the custom numerals you select. We know that quality counts and that is why we offer all of our Cuda body tape stripe kits with a 100% money back guarantee. You can find 318 kits here, 340 kits here, 383 kits here, 440 kits here and HEMI kits here. If you are in the market for a 1970 Challenger T/A Rear Spoiler then you have got to checkout Josh’s Muscle Car Parts. Almost two years ago Josh saw a real problem with the Mopar reproduction spoiler market. One could find a nice reproduction T/A rear spoiler, but would spend two arms and a leg. Or one could find a cheap reproduction and get just that, a cheap reproduction. After developing a quality reproduction spoiler that met both of the above criteria Josh rested assured that his spoiler would be the best quality. His spoiler would also be very competitively priced. 1972-1974 Dodge Challenger Grill Molding from Josh’s Muscle Car Parts is a great way to bring the original beauty back to your Challenger. This Challenger molding is made to fit and appear exactly like the originals.